When using a compass, why not follow a degree mark without rotation? Instead of taking a bearing the "official" way, why not just see what degree mark corresponds to on the direction I want to go (in real life or on a map), and follow that degree mark? That is, why do I need to go through aligning edge of compass, rotating the bezel to align the meridian lines, rotating body so compass needle aligns with orienteering arrow? Clarification: Assume point B is exactly NW of point A. If I want to go from point A to point B on a map, I'd be tempted to do as follows: Orient map so magnetic north on map corresponds to north on compass (needle), then see where point B is in relation to point A (at compass bearing 315). Then, I'd pick a landmark in that direction, head to it, and then repeat. My point is at no point in this process did I need a compass with a baseplate or travel arrow and I never needed to rotate my bezel to align to meridian lines, etc. So I'm stumped about why I need to go through all of those steps. I do fully understand that those may be good skills to have for other more complex needs down the road... just wondering if I'm missing something in my simple approach to issue at hand. The old style pocket compasses worked just like that. The problem: If you use a compass without using that arrow -- just using the degree marking on the dial, your error will about triple. If you hold a compass at waist level look down at it, and look up, you won't be looking the same direction. You can increase the accuracy by first pivoting your whole body so that the arrow is at right angles to your body. You can increase it again by holding the compass at nose level so you can just lift your head an inch or two to shift from compass to world. This is why they make sighting compasses. These are ones with a mirror so you can read the needle AND look at the world at the same time. In theory you can get within about 2 degrees with these. In practice, 3-4 is the best I can do, since my eyes will no longer focus both on something that near and a distant object. Orienting the map is a way to check assumptions. Remember that all maps lie. Better maps have fewer and smaller lies. Most of the lies are ones of omission. They 'forget' to tell you about something. You're talking about aligning the map, and no, it's not strictly necessary if you're sure of where you are and where you're going next. You certainly don't need to be that accurate about aligning it, "I can see the Sun and it's within an hour of noon so that's South" is good enough for most purposes. However it's a useful skill and while learning to navigate with a map and compass you should learn it just in case you do reach a situation where you need to be more accurate. If you're going to that much effort, you should have a route plan written up that shows the bearing you want to be taking at each change of direction. Again, not strictly necessary, but nice to have. While you can just follow a pre-calculated compass bearing, that's remarkably hard to do. What's better is to check the bearing, note a landmark on the horizon in the right place, and walk towards that. The point of aligning the map is so that you can look around you and compare it to the map to be sure of your location. There should be a forest to my left, a mountain peak to my right and the river alongside me. It allows the map to be your primary navigation tool with its much more descriptive information about where you are, rather than using the compass and trusting the numbers. There's quite a bit to unpack in your question, beginning with some basic terminology. Because maps are two dimensional projections the north on a map is grid north and not true north. This should be obvious if you consider lines drawn north from any two points will be parallel, rather than intersecting. Ordinary navigation requires a transform from grid north to magnetic north, which is what the bezel dance is accomplishing. I agree with you that it's time consuming and onerous. Much worse is the fact that it forces people to develop operating the compass as a skill, rather than actual navigation. The compass with baseplate is meant to spare you having to carry a protractor to read bearings off of the map along with the arithmetic to transform the bearing. The reason you don't orient the map and read a bearing with a compass is accuracy. An initial error of a couple degrees results in a very large displacement if you travel any significant distance. Ending up hundreds of meters left or right of your target is hardly efficient. In some terrain it can be very difficult to recover from. Following a magnetic bearing well is a skill in itself. In fairly open terrain the system you suggest of picking a landmark and heading towards it works well. In dense terrain you introduce errors every time you step around an obstacle. Alternating left and right deviations minimizes your distance off azimuth, but doesn't address the fact that early errors are more significant. Obstacles are never uniform sizes either, so with experience you may walk left around two small ones then right around a larger one. In the end it comes back to accuracy. In dense or featureless terrain accuracy is more important because errors are more difficult to recover from. The same applies at long distances. It's not uncommon for people to continue blindly shooting azimuths to trees not realizing that they're already lost, or the next best thing to it. (Equally as bad, walking to the wrong tree at least once in the process.) If you pull that when you can't see any landmarks you'll be stuck. Most common casual hiking scenarios are somewhere in the middle. You can't afford to shoot from the hip, but you don't need complete precision either. You may carefully navigate long legs of the trip and wing it for short sections. There are times when accuracy counts. A map will tell you where there is a dangerous or sensitive area, like highways (where you might miss a pedestrian crossing), cliff, body of water, private property, hunting area, protected habitat, industrial complex, high security area, etc. By approximating by eye, you could miss a trail that properly takes you around such hazard. Along this vein, there could be ambiguous sightings, and it's not easy to discern where you are with respect to one landmark or another. A compass can help you make a better determination of where you are. Conversely, compasses work on magnetism. There are places where environment can affect the effectiveness of a compass, see here; or, you lose or break your compass. In these cases, it is advisable that you have a backup plan to be able to read a map without a compass. Also, this may seem like a cop-out, but, by foregoing accepted practices for orienting a map, you lose a skill that you may eventually need. Also, that sets a bad example for those in your group. It is like asking "why do I need a floatation device if I already know how to swim". Magnetic declination! True north, magnetic north, and grid north point at different things. The map you are looking at is referencing true north, or maybe grid north, while the compass is pointing to magnetic north. 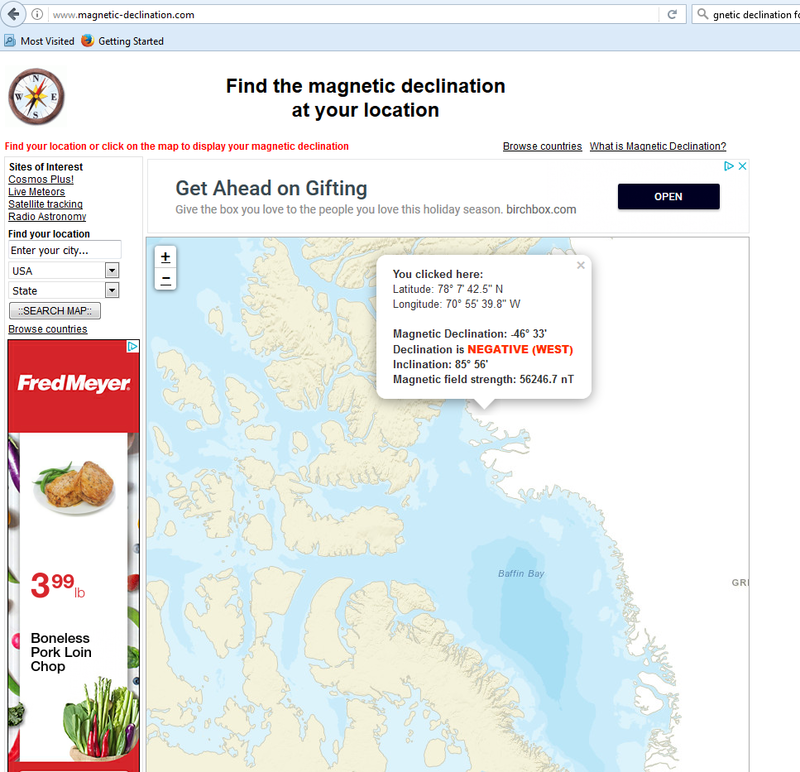 If you are in Greenland your map (oriented to magnetic north) will be 46 degrees to the west of true north. So if you start walking at 45 degrees from magnetic north you will actually be heading north and not to the northwest. You will never reach your destination. Not the answer you're looking for? Browse other questions tagged hiking maps compasses or ask your own question. What is dead reckoning when navigating with a map and compass? Can a compass be thrown off by its surroundings? What things should I look for when buying a compass? Is using ultralight gear possible without sacrificing safety, comfort, or skills? When is it a bad idea to follow a game trail? How to take a bearing when the geographic coordinate grid is not aligned with true north on a map?